I thought up the idea of making a pasta dish with enchilada sauce a long time ago, but never quite got around to it until I saw it on another blog and realized how amazing it looked. I used some of the ideas I saw there when I created my recipe. This dish makes a nice change from regular Mexican enchiladas, and I guess it makes a nice change from regular Italian pasta dishes, too. Hmm. 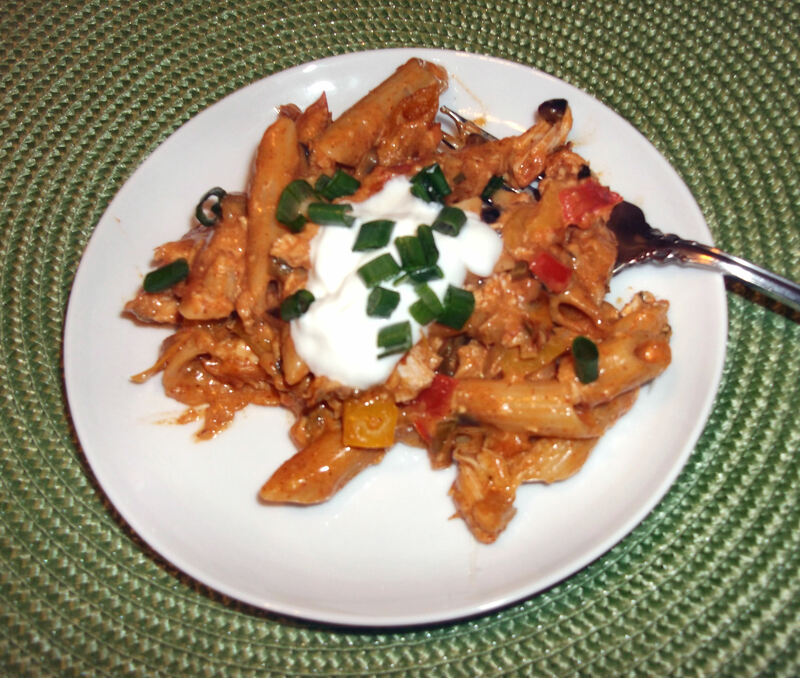 Either way, it’s something different, super yummy, and a great way to use up leftover chicken. Preheat oven to 350 degrees F. Cook the pasta in boiling, salted water for about 6 minutes (only half of the suggested cooking time, as it will finish cooking in the oven); drain and set aside. In a large pan, heat the olive oil and sauté the bell peppers, tomatoes (if using), and green onions until slightly softened, about 2-3 minutes. 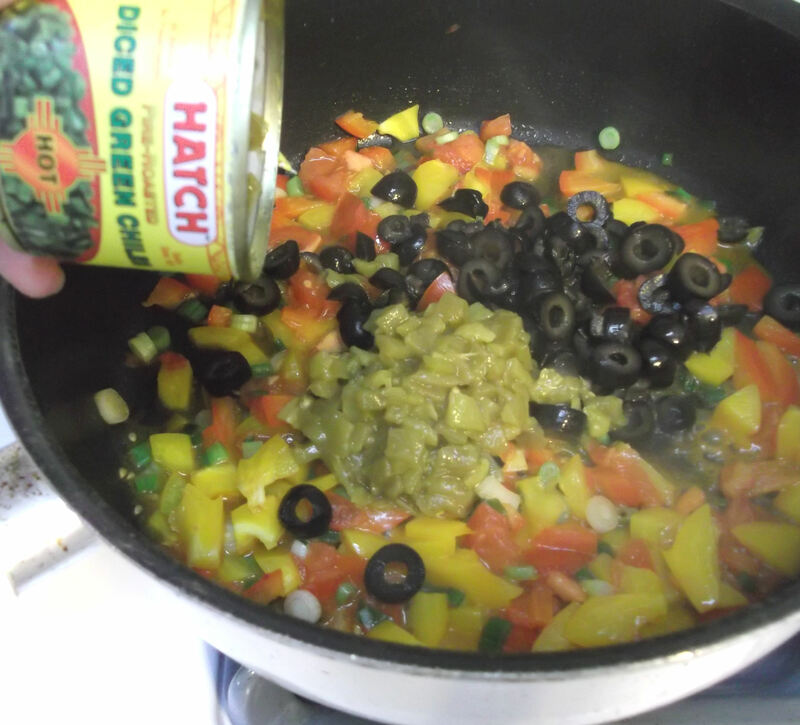 Add the olives and green chiles, stir to mix well. 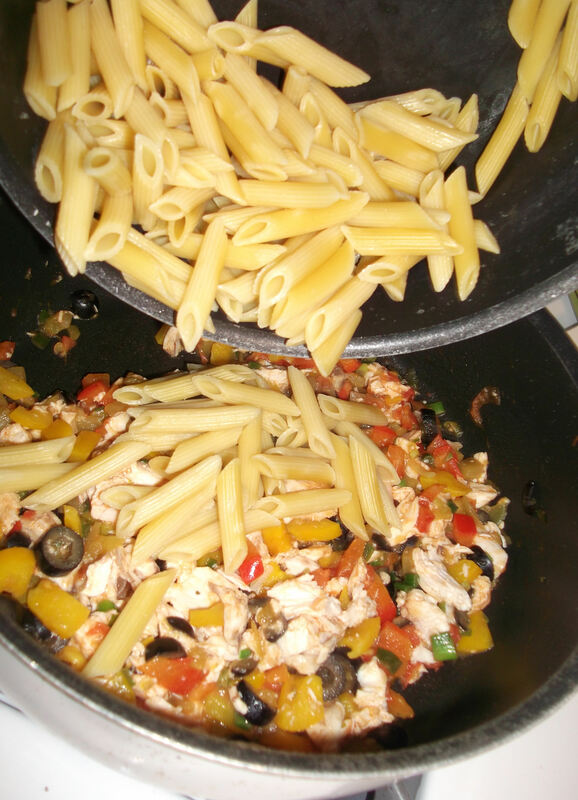 Stir in the chicken and then add the pasta. Add half of the shredded cheese, stir, and then add the enchilada sauce; mix well. 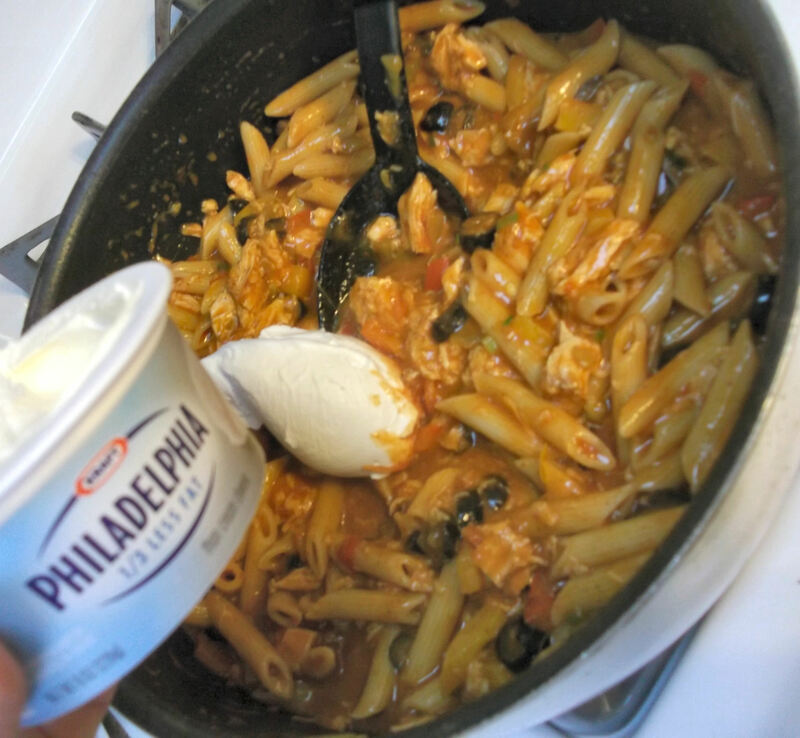 If using cream cheese, add that now and stir until it’s melted; the mixture should be well blended and the pasta well coated at this point. Spray a 9×13 pan with olive oil or cooking spray. Pour the mixture into the pan and spread it around evenly. 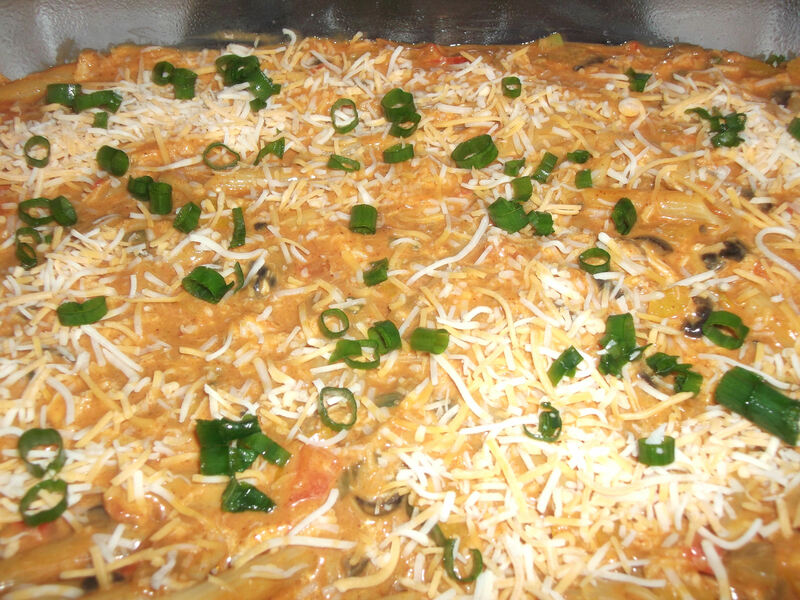 Top with the remaining shredded cheese and half of the chopped green onion tops. Bake until the cheese has melted and the mixture is bubbling: if the mixture seems dry or if it is light on sauce, bake covered for 15 minutes and then uncovered for about 5 minutes; otherwise, bake uncovered for 20 minutes. 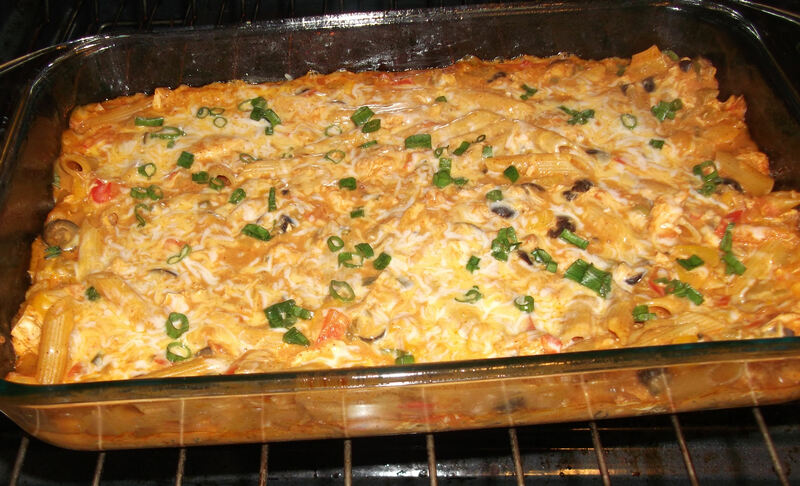 Serve topped with sour cream and remaining chopped green onion tops. Start by partially cooking the pasta, just enough to soften it a little. It will finish cooking in the oven, but will turn mushy if completely cooked ahead of time. It should be softened but still firm, and you will be able to see a little of the starch (white part) if cut in half. 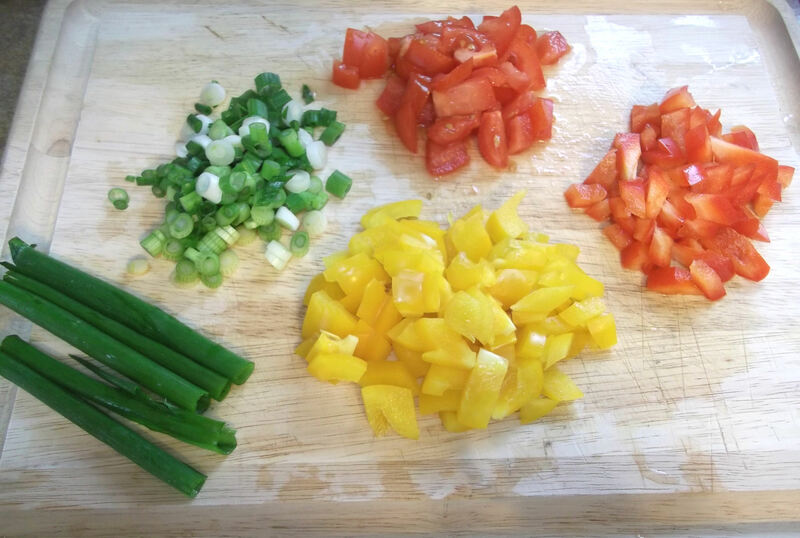 While the pasta cooks, chop the green onions (chop the green onion tops, too, and set them aside for later), bell peppers and tomatoes (if using). I only added the tomatoes because I had some around. Look at all that tasty color! In a large pan, heat the olive oil and sauté the bell peppers, tomatoes and green onions until slightly softened, about 2-3 minutes. Add the olives and green chiles. Start with only half the can of green chiles, as they pack a pretty good punch. You can always add more later if you like it really hot. And if you really love olives, feel free to add more. 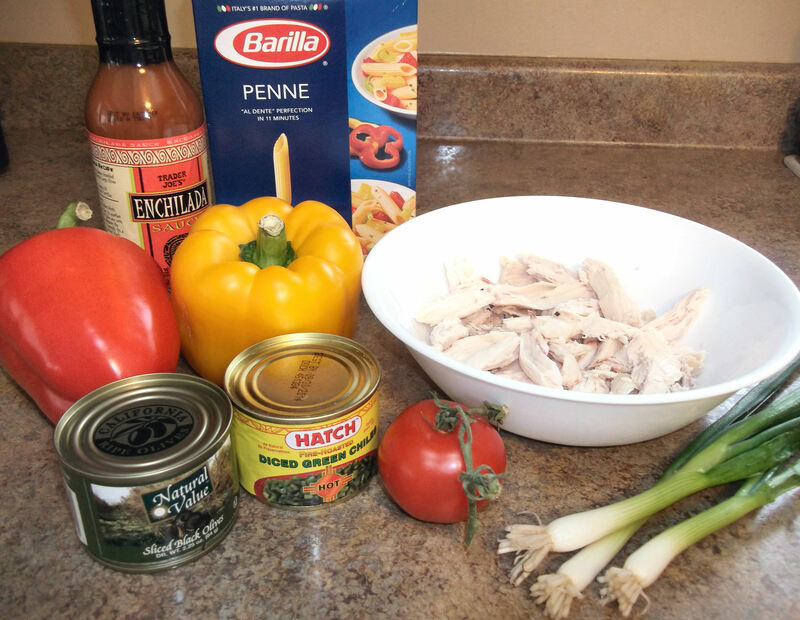 Add the chicken, stir to mix well, and then add the pasta. Add half of the shredded cheese, stir, and then the enchilada sauce; mix well. If using cream cheese, add that now and stir until it’s melted; the mixture should be well blended and the pasta well coated at this point. The cream cheese helps to give the sauce a creamy, velvety texture. Taste the mixture and season with salt and pepper if needed; add the remaining green chiles, too, if desired. Spray a 9×13 pan with olive oil or cooking spray. Pour the mixture into the pan and spread evenly. Top with the remaining cheese and some of the reserved chopped green onion tops. Bake until the cheese has melted and the mixture is bubbling. Covered or uncovered? Chef’s choice: I’ve done it both ways, depending on how cooked the pasta felt, and how much sauce I had. If the pasta mixture seems a little dry, or if you went light on sauce, bake covered for 15 minutes and then uncovered for about 5 minutes; otherwise, bake uncovered for 20 minutes. Serve topped with sour cream and remaining chopped green onion tops. Enjoy!